The watershed restoration and habitat enhancement market is growing rapidly across North America. 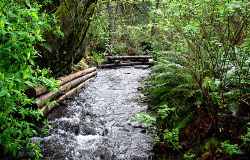 Growth is driven by 1) public policy that encourages or mandates restoration of habitat for endangered and threatened species; 2) increased demand by recreational fishers, hunters and wildlife observers to improve the populations of target species; and 3) recognition that environmental restoration and protection should include structural habitat as well as water quality objectives. Dooley, J.H. 2002. Technical products from small diameter timber for habitat enhancement and watershed restoration. In Small Diameter Timber: Resource Management, Manufacturing, and Markets, edited by M. F. Baumgardener. Spokane, WA: Washington State University Cooperative Extension. An under-appreciated outlet for small diameter roundwood is in watershed restoration, environmental, and habitat enhancement programs. Over $2 billion is spent in North America on habitat enhancement and watershed restoration each year. Of that amount, our estimate is that approximately $300 million is spent on materials that could be made from small diameter timber. Products manufactured from forest thinnings and subsequently placed back in the watershed completes the watershed cycle, and at the same time provides income for forest landowners, woods workers in rural communities, and environmental restoration contractors. This presentation details a number of technical products that can be manufactured from small diameter timber for use in erosion control, watershed restoration, and habitat enhancement. Dooley, J.H., K.M. Paulson, J.T. Maschhoff, and K.R. Chisholm. 2000. Functional performance of engineered LWD for fish and wildlife habitat enhancement. ASAE Paper PNW2000-06. St. Joseph, MI: American Society of Agricultural Engineers. 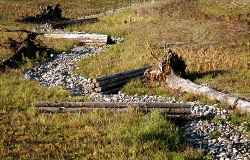 An engineered large woody debris structure has been designed and developed for use in habitat and watershed restoration projects. The ELWd® structure was designed according to the Appreciative Design method to accommodate readily available wood materials, low-tech manufacturing methods, and volunteer-based installation. Technical features include a high organic surface area, structural integrity in an all-wood product, length proportional to channel properties and diameter proportional to flow depth. Equations for appropriate structure length and diameter as functions of channel properties were derived from the literature. The ELWd® structures have now been installed to provide a number of different functionalities including: scour pool formation, complex cover features, bank protection, flow routing, sediment storage and high flow refuge. The paper describes the design rationale and critical assumptions that resulted in the present configuration for ELWd® structures, and results of the first three years of in-stream use. Maschhoff, J.T. and J.H. Dooley. 2003. Functional Requirements and Design Parameters for Restocking Coarse Woody Features in Restored and Enhanced Wetlands. Presented at the 2003 Joint Regional Conference of the Society for Ecological Restoration, Northwest Chapter and the Pacific Northwest Chapter of the Society of Wetland Scientists, Portland, OR. March 27, 2003. 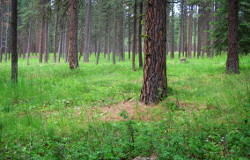 For many years landowners, biologists, engineers and others removed large woody materials such as logs, rootwads and stumps from wetlands, floodplains, and streams of the western United States and Canada. By the early 1970's scientists and engineers began to recognize the critical roles that wood plays in the life cycle of fish, amphibian, small mammal and bird species. Removal of wood greatly decreases the carrying capacity of wetlands and streams for many of the species currently protected under the Endangered Species Act. In recent years, creation, restoration and enhancement of wetlands has become common practice. Little consideration has been given to woody debris and other structural habitat in wetlands. This paper discusses functional objectives, common constraints, and design parameters for restocking woody habitat features in wetlands. Examples of completed projects from ELWd Systems are used to illustrate design parameters. Technical Background: Engineered Log Jams. Dooley, J.H. 2001. Technical Background: Engineered Log Jams. Technical Report. Forest Concepts, Federal Way, WA.